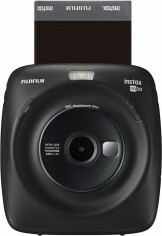 The new Fujifilm Instax Square SQ20 will replace the SQ10 hybrid instax/digital camera. The Fuji SQ20 adds a selfie screen on the front, has a 33.4 mm F/2.4 lens, can focus as close as 8cms from the subject, and comes in Beige or Black colourways. The Fujifilm Instax Square SQ20 will be available in Beige or Matt Black for £179.99 from October 20th, 2018. Introducing new features to the instax line of instant photography to capture every important moment. Valhalla, N.Y., September 24, 2018 – FUJIFILM North America Corporation announced today the arrival of its new instax SQUARE SQ20, a sophisticated square format hybrid instant film camera that combines digital imaging technology with square film prints. Also announced today are new colors for the instax SQUARE SQ6–Ruby Red and Aqua Blue–and new instax Double Sided Stickers that allow users to stick instax film quickly and easily to a multitude of surfaces. As a hybrid instant camera, equipped with a digital image sensor and digital image processing technology, the SQ20 offers users the ability to select their favorite images to print. Users can even edit and apply various filters. Using the 1:1 aspect ratio, instax SQUARE film allows for more capture of the scene in a single photo, delivering exceptional image quality with numerous artistic expressions. For the first time in instax instant photography, the SQ20 introduces the motion mode. Utilizing a dial on the back of the camera, users can take a video of up to 15 seconds and choose the best moment of a moving subject to print, which can often times be difficult to capture. The new time shift collage function lets SQ20 users take 4 images at one time with a time difference by pushing a single button. The time difference between images can be personalized and adjusted by 0.2 seconds up to 2.0 seconds. The sequence filter offers the ability to capture dynamic images, adding a dreamy feel to the image. For added usability when taking selfies, a small mirror is located next to the lens to ensure accurate capture. Further, group photos are made easy with the SQ20’s built in timer. With this hybrid instant camera, photographers at all levels can select the images they would like to print and even edit pictures. The SQ20 has 16 different filters that can be applied to both still images and videos. Stylish and easy-to-hold, the SQ20 is available in two color options–matte black and glossy beige–making for a chic shooting companion. With its special shooting modes, the SQ20 achieves added creative possibilities. With double exposure, users can superimpose two images on a single film by simply pressing the shutter button twice. Bulb exposure mode is used to capture long exposures at night as well as light trails, while the split mode allows for two images to print on a single film. Available in two colors, Matte Black and Glossy Beige. The instax SQUARE SQ20 will be available on October 20th, 2018 in the U.S. and Canada for USD $199.95 and CAD $249.99, respectively. Also announced today are two new colors for the instax SQUARE SQ6 square format analogue instant camera that was introduced in May 2018. The SQ6 was originally available in three colors: Pearl White, Blush Gold and Graphite Gray. In October, the SQ6 will be also available in Ruby Red and Aqua Blue, both stylish colors that have been requested by instax users all over the world. Macro mode / landscape mode. Selfie mode & selfie mirror. The instax SQUARE SQ6 Ruby Red and Aqua Blue, will be available in October 2018 in the U.S. and Canada for USD $129.95 and CAD $159.99, respectively. New instax double sided stickers, also being launched in October, will allow users to stick instax film quickly and easily to a multitude of surfaces. From walls to scrapbooks, users can display their instax pictures with ease. These new double sided stickers can be used with all instax film sizes and expand the creative possibilities that instax has to offer. Double Sided Sticker size: 30 x 40mm. 12 double sided stickers per pack. Adheres and re-sticks to virtually any surface, quickly and easily. Instax Double Sided Stickers will be available in October 2018 in the U.S. and Canada for USD $1.99 and CAD $2.99, respectively. Capture and print the best moments of moving subjects. PHOTOKINA 2018, COLOGNE, GERMANY, September 25th, 2018 －FUJIFILM Corporation (President: Kenji Sukeno) is pleased to announce that it will launch “instax SQUARE SQ20” (SQ20) compatible with SQUARE format film as a new addition to the instax instant camera product range. The SQ20 has a variety of functions such as ”Motion Mode” which can print the best moment of a moving subject, and other new functionality allowing you to now enjoy dynamic photos. The stylish and easy-to-hold design allows this instant camera to be taken anywhere, ensuring you never miss that one-off moment. The SQ20 offers a wide variety of functions that allow you to enjoy both taking and printing photos. In addition to shooting still images, a new function called “Motion Mode” allows you to shoot a video of a moving subject (max 15 seconds), select a frame and easily print the best moment—something that has been difficult to achieve before. The “Time Shift Collage” function allows you to enjoy a new photo shooting experience by taking four images with a time difference, with one click. The special filter “Sequence” can take dynamic photos by adding sequence effects to the image. 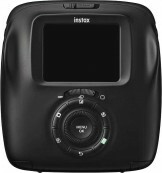 The camera is also the first in the instax product range to feature a zoom function prior to shooting. In addition, there is also a selfie mirror located to the side of the lens to help frame selfies perfectly. As a hybrid instant camera, equipped with a digital image sensor and digital image processing technology, the “instax SQUARE SQ20” allows you to select and edit your favourite images before printing, providing the opportunity for a wide variety of creative photographic expression. The camera is stylish and easy-to-hold. There are two colour variations with matt black to suit any scene and style, and beige for an elegant and fashionable feel. The design of the lens ring—and around the ring—is reminiscent of a water ripple. It not only makes the camera easy to hold but demonstrates a contemporary, new design feature. The ‘instax SQUARE SQ20’ will be stocked by Amazon and Jessops in the UK. The results of all operations including shooting, editing/processing and printing are displayed on the LCD monitor. By taking a video (max 15 seconds) and using the dial on the reverse of the camera, the camera allows you to select and print just the best moments. This function can take up to 4 images within a time frame at once. The time difference among images can be adjusted up to 2.0 seconds by 0.2 seconds. This function allows you to take dynamic photos by adding a sequence effect to the image. There are a wide variety of editing functions such as a variety of filters including partial colour filter function, vignette control, and brightness adjustment. With these kinds of editing effects, various types of shooting and printing can be made for both video and still images. The camera has special shooting modes such as double exposure that can combine two images onto one image, while the bulb exposure function is useful for night and illumination scenes. 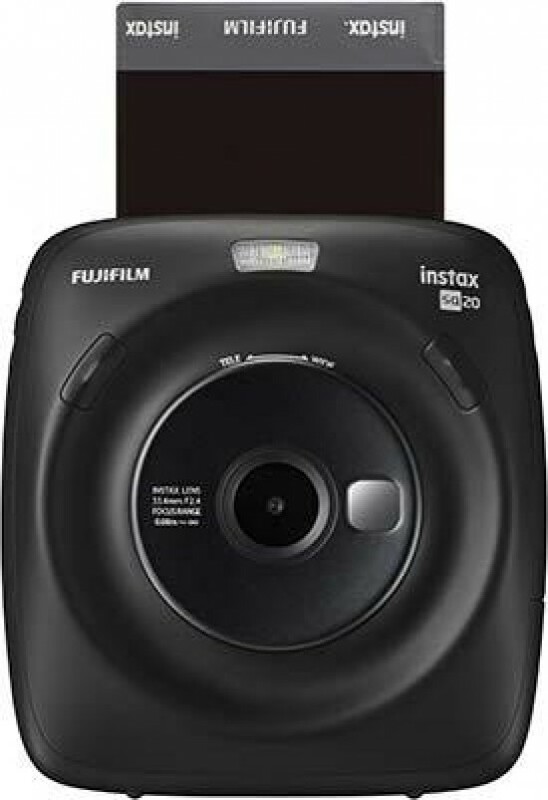 The SQ20 is the first camera with zoom function in the instax product range. A selfie mirror attached to the side of the lens allows you to check the shooting range of selfies. The camera has an iconic design with a thin, round, symmetrical shape for easy grip. 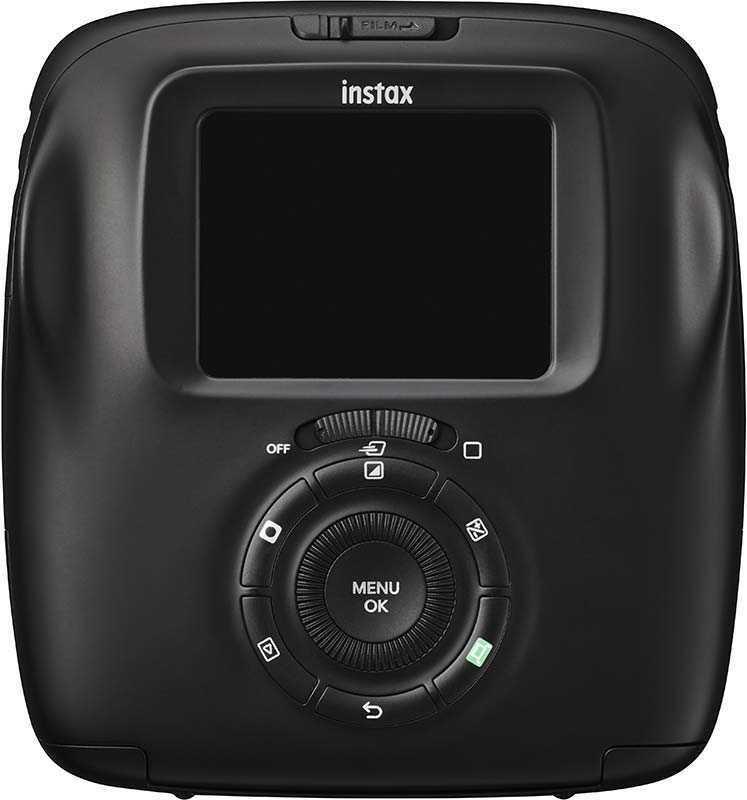 It has a dual shutter system with two shutter buttons – one on the right and one on the left. The design of lens ring and around the ring imitates a water ripple, making the camera easy to hold.